Lollapalooza | Do You Hear The Music? This one is special to me and I’ll champion Walk The Moon for as long as I can because they are a great group of guys and their music is fantastic. I only wish for good things to happen to good people. 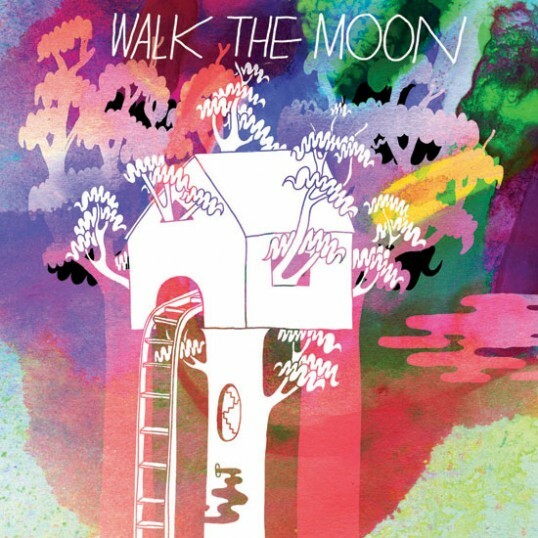 I was a fan of Walk The Moon the first time I ever heard “Anna Sun” and wrote about them on the blog back in May of 2011. I first saw them on the Sonic Bids Stage at Bonnaroo later that year and was enamored with their live show. At the time I was writing concert reviews for Vegas Seven and was asked to start interviewing bands for some upcoming columns. The first ask was to Walk The Moon. I ended up meeting the guys in the Lollapalooza media village where we proceeded to sit Indian style in a circle underneath a tree so I could conduct the interview. It was so bizarre yet worked beautifully. Since those days the guys have exploded and are riding an all time high to stardom and I couldn’t be more excited. They put out as much energy as any band on stage and what they receive from the crowd is tenfold. It’s a sight to witness and on Sunday of Life is Beautiful, I cannot wait to see thousands of screaming fans singing and dancing. Get your face paint ready, pull out your dancing shoes and let’s go! 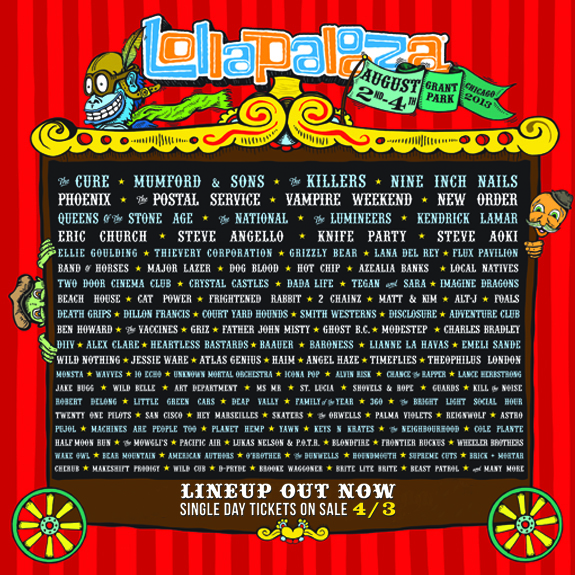 If you read the blog last week you’ve already seen who’s playing at Lollapalooza this August but if not, below is the lineup poster. Should be another solid three days/nights in the Windy City and I have to say, nice to see The Dunwells on here again as their set was washed out in 2012. And thanks Chicagoist for the below breakdown by day. TGIF, March Madness edition only because MUSE’s “Madness” is the official song for the NCAA coverage of the basketball pandemonium. Did you see that Prince is going on tour? Dropped in the evening a couple nights ago, dates appeared and if you live in Las Vegas, get set for four show opportunities (early and late show each night) April 26-27 at The Joint at the Hard Rock Hotel. The Chicago Tribune leaked out a handful of acts/headliners for Lollapalooza this summer which includes Mumford & Sons, The Killers, Phoenix, Vampire Weekend, The Postal Service and The National. Neon Reverb is going on this weekend in Las Vegas! Make sure to check out the schedule and head to Beauty Bar and The Bunkhouse for some awesome music. Shout out to American Eagle for using Wild Cub’s “Thunder Clatter” in their new video. Those fellas are about to blow up! Stoked for that to happen. Excited for Record Store Day? You should be. Check out all these releases that are coming on 4/20. I can sum my Lollapalooza experience up quite easy: an incredible time with great friends. Any chance I get to return to the city of my birth I’m excited but add in a music festival with 100,000 people in Grant Park and you crank it up to 11. This year I approached Lolla a bit different and wasn’t running from show to show. I took the pace down a little and really stepped back to enjoy it a bit more. I was late to some shows which was unfortunate but at the end of the three days I was still stoked about who I saw and just wonder what may have happened if the Saturday afternoon storm evacuation didn’t cancel acts like Alabama Shakes, The Temper Trap, B.o.B. and the band I was most hoping to see, The Dunwells. Props to C3 Presents for acting swiftly to recover and push back start times, reschedule bands like fun., Chairlift, Empires, etc. C3 also did an incredible job of scheduling overall forcing the crowd to pick and choose like I’ve never seen. When you are looking at a mile walk from the Bud Light Stage to the Red Bull Stage, it’s just not really possible to get everywhere you want to be unless you are a marathon sprinter. Headliners: I have to be honest, you shouldn’t have gone to Lollapalooza just for the headliners. Talented musicians indeed (and ones I like) but you can’t compare The Black Keys, Black Sabbath, Avicii, Justice, Jack White and Red Hot Chili Peppers to last year’s of Coldplay, Muse, My Morning Jacket, Eminem, Foo Fighters and Deadmau5. My Moment of Joy: Seeing the rambunctious overfilled crowd on hand for Of Monsters and Men Sunday night time slot. My Favorite Show: Didn’t actually happen at Lollapalooza. 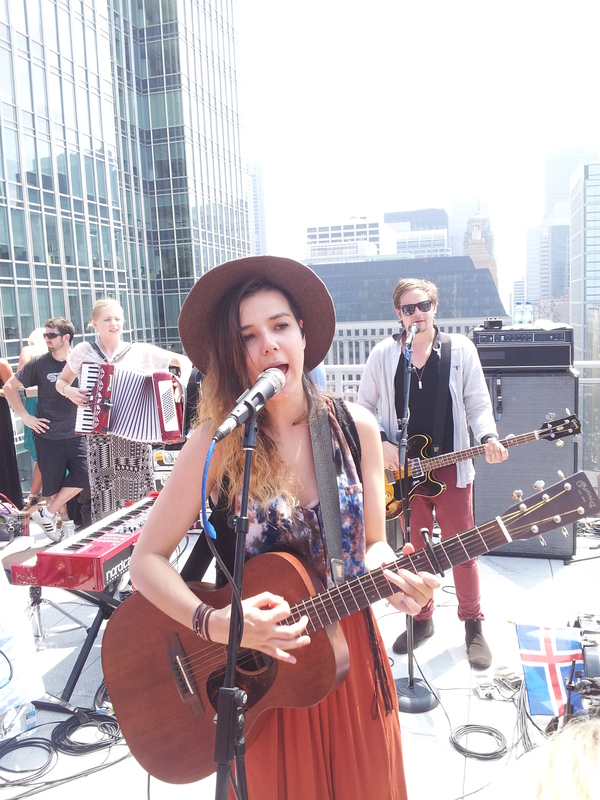 Off-site Of Monsters and Men show on the rooftop of a condo tower for Gilt City’s ‘Better Than Backstage’ party. Thanks to my friend Nicole for making it happen! Seriously one of the top three bands I was dying to see at the festival and here I am just inches away as they rocked out. A tip of the hat to an amazing group of musicians doing big things. Best Overall Show: Die Antwoord, my second time seeing them and this was just flat out awesome. They had the crowd mesmerized and loving every moment of this high energy set. Best Bud Light Stage Show: For me, Passion Pit – flat out great performance but easily it was Florence + The Machine, she had at least half the festival goers on hand to hear that incredible voice. I remember the first time I saw her was in a small tent at Bonnaroo and she owned Lollapalooza. Say hello to next year’s festival circuit headliner. Best Red Bull Stage Show(s): I guess The Black Keys, those guys are just so honed in and solid in front of big crowds. Best Playstation Stage Show(s): Die Antwoord, Gary Clark Jr.
Best Sony Stage Show: Last year I spent the most time at this stage. This year I only really saw Miike Snow. Best Google Play Stage Show: The Gaslight Anthem, the Jersey rockers did exactly that making the most of their 45 minute set. Best BMI Stage Show: Well the only one I actually got to this year was Outasight and he had the crowd bouncing. Best Perry’s Stage Show: In truth, I didn’t even see a show here, passed by a lot but didn’t get caught up in the pandemonium but the stage setup that may have been the best show. LED bonanza creating quite the visuals. Biggest Surprise: How much I enjoyed the Metric show. Best Legend Show: I just have to say Black Sabbath for the sheer fact that I saw Black Sabbath, even if Ozzy is starring into gigantic teleprompters and not sounding too good. Random Moment(s) Of Awesomeness: fun. show being rescheduled after the Saturday evacuation and just owning the crowd for a 35 minute set filled with their hits. Most Disappointing Moment: not getting to see a bunch of acts I was super excited to see for the first time like Milo Greene, First Aid Kit and The Dunwells (the rain ruined that one for me) and some of my favorites like GIVERS, Chancellor Warhol, DAWES. Next Big Thing: I want to say The Dunwells but the evacuation for the storm forced a cancellation of this show. And I sincerely hope more people discover Michael Kiwanuka; he’s got an incredible voice, great songs and is an absolute treat to listen to live. Giving it a shot: The Devil Makes Three and I absolutely loved them. Top Party: I’m giving this to Passion Pit because it was entertaining, full of energy and well I am a fan. Funky Good Time Show: Gary Clark Jr.
Top Moment: Choosing to skip Milo Greene, Chancellor Warhol, JEFF The Brotherhood and GIVERS for a once in a lifetime moment with Of Monsters and Men on the rooftop with the Chicago skyline serving as the background. Evacuation Nation: Wow, getting 100,000 people out of the park in approximately 30 minutes before the torrential storm came in was pretty incredible. Holed up in a steamy Irish Pub with $6 Bud Lights wasn’t ideal but it was festive and one of those random things you won’t soon forget. Clutch Move: Popping out a little early on Friday night to head over to Big Star, my favorite taco and mescal joint in town. Tip For Next Year: Coming a day early again and leaving on a later flight on Monday. More Tips: drink water, more water, sunscreen is your second best friend after water, if you see someone struggling give them a hand or find someone to help. Holler for Lolla! Chicago, Grant Park, Lollapalooza, Let’s Go! Oh how sweet it is, the second city becomes numero uno in the music world this weekend as Lollapalooza gets underway today! If you can’t make it, stream it. If you can’t stream it, listen to this little Lollapalooza playlist I made on Spotify. Will try to get some updates on the blog throughout the festival and you can expect a full recap following. Lollapalooza Week on DoYouHearTheMusic.com continues with another rising act you should most definitely be listening to. Final thoughts: Melodies, harmonies, real music. These guys display all of it and in such a perfectly balanced way. Why I’m excited: These guys are brilliant. How else do you explain them creating an alias, “Milo Greene,” while in college to serve as their booking agent/manager? Fast forward as they morphed into literally, Milo Greene. Musically, I love how these five individuals have found a way to craft a whole bunch of music styles under one roof through each of their own unique strengths. When listening to the self titled album I feel like I’m being taken on an adventure and I like it. Final thoughts: I really dig Marlana Sheetz’s voice, stunning. Check out their performance on Letterman earlier this summer. And at Lollapalooza, Milo Greene pulled an early time slot but for those of you going, this is a great way to start your Saturday. Bring a blanket and just chill out on the grass as you watch this rising band take you on your own adventure. My recommendation, arrive early and stop at the Google Play stage to a couple songs from the Kopecky Family Band and then continue moving to the Playstation Stage for Milo Greene. So this week it’s all about Lollapalooza on DoYouHearTheMusic.com. Most everyone is familiar with a lot of the acts performing this weekend so I’m going to throw some info out there on some artists and bands you may not be up to speed on. Today’s group is actually a band I cannot wait to see, one of the must see shows for me. Who? Two brothers, two cousins and one more mate from Leeds, England. What? A five piece band destined to make it across the pond in America. Check out their debut album, Blind Sided Faith. Why you should listen? Their indie-folk sound is full of beautiful harmonies any music fan will love – plus they add a little slice of Americana to their music. A reason you’ll be excited? These boys are now on a mini US Tour so get out and see them at a venue near you. Why I’m excited: These guys just bring it and I can’t wait to see them perform live. From their folk to blues and rock to soul, they are all over the place but in a unique way that blends together perfectly. Final thoughts: At Lollapalooza these guys have to compete in the same time slot as Alabama Shakes, The Temper Trap, fun. and B.o.B – how’s that for being relative nobody’s right now? I’ve seen every act but The Dunwells and I cannot wait to see them rock the BMI Stage this weekend. I promise that for anyone opting to check these guys out, you will be thankful and have one heck of a story to tell when they break it big. My recommendation, catch the top half of Alabama Shakes and make your way to The Dunwells. Saturday, August 4, 4:30-5:10 p.m.
News: @WalkTheMoonband Self Titled Album Drops Today! I couldn’t be more excited today for the fellas of Walk The Moon as they release their self titled debut album on RCA Records. Having had the pleasure of meeting the guys, interviewing them and seeing them in concert at Bonnaroo, Lollapalooza and here in Las Vegas I feel like I’ve kind of been along for the ride a little. I’m beyond stoked that they are now getting heavy airplay, being tabbed by MTV as a Push artist, Esquire.com adding them to the songs of the summer (for a second year in a row) and more. These guys are still ascending and it’s one of those things that just makes me smile; plus I think everyone should be digging their music and right in time for summer it’s perfect tunes to enjoy three months of sunshine. Added bonus, tune in to David Letterman tonight where the guys will be the special music act.